A lot of the challenges that fleet managers face are the same challenges that managers of others businesses face. Almost all challenges in a business boil down to one of two things: reducing costs or increasing profits. While the challenges may sound familiar no matter what industry you are in, though, the solutions to the challenges below are unique to fleet management. Let’s take a look at some of the biggest hurdles that fleet managers are facing and some of the ways they may be able to overcome them. Do Any of These Fleet Challenges Sound Familiar? Fleet drivers are generally more likely to get in an accident as compared to non-fleet drivers. It’s purely a matter of statistics. Your fleet drivers spend hours behind the wheel and put in thousands upon thousands of miles on the road every year, giving them more time and more miles in which to have an accident. But that doesn’t mean those accidents aren’t preventable. In the Fleet Accident Management Survey done in 2016, it was found the that most common kind of accident that fleet drivers face is being rear-ended. That’s not surprising; there is an increase in the number of rear-end accidents among all drivers in the United States. It’s believed that the cause is distracted driving, which is very often due to drivers looking at their cell phones. And while fleet drivers aren’t at fault when they’ve been rear-ended, they aren’t without blame themselves. Fleet drivers who are between the ages of 25 and 35 and have been driving for more than a year are the group most likely to be in an accident, and distracted driving is again one of the main culprits here. Many of the accidents that occur within your fleet could have been prevented. Keeping drivers safe has a big impact on a company’s bottom line. There are huge expenses associated with fleet accidents, including property damage, insurance increases, worker’s compensation claims, reduction in productivity, and potentially even third-party lawsuits. Increasing the safety of your drivers will help strengthen the reputation of your company as well as the health of your bottom line. Continuous driver education and retraining. Training a driver once isn’t enough. Your drivers should be attending safety courses regularly to remind them of rules and expectations and keep safety information fresh in their mind. Equip vehicles with latest safety equipment. While there is no vehicle out there that’s “accident proof,” there are a number of features available that can reduce the risk. These include backup cameras, automatic braking, blind spot detection, and so much more. Make sure your vehicles have the latest and greatest. Use telemetrics. Drivers who know their productivity and performance are being tracked are more likely to practice safe driving habits. Gas prices have a huge impact on the profitability of your fleet, and unfortunately, they are hard to track and predict. Natural events like hurricanes and major political events can all have an effect on fuel prices. For instance, CNN reported that gas prices in the first week after Hurricane Harvey shot up 3%, rising by as much as 25 cents across the United States. By September of this year, gas prices had reached a two-year high. That’s bad news for any business that depends on gasoline, especially if you need a fleet to get the work done. It’s a constant battle of trying to reduce fuel costs while also trying to predict how much the fuel is going to cost you in the first place. That means the best way to manage the problem is to try to get fuel costs down as much as possible in the first place. That way there is less of an impact if gas prices hit a sudden spike. Reducing fuel costs isn’t easy, though, and it’s something that you’ll need to constantly be evaluating with your fleet. Put targets in place for your drivers. Set expectations for average mile per gallon and how much they should be spending on fuel. Give feedback on performance so they know how their numbers compare to the overall company goal. More driver training. Teaching fleet drivers how to drive in order to maximize their fuel economy is vital. Make sure your drivers have the tools and training necessary to reduce those expenses. Monitor driver performance. The right fleet management software can help you track driver performance along with idle time and route planning to reduce fuel expenses. Decreasing overall expenses for the fleet. Fuel isn’t the only expense when it comes to your fleet. Some of the biggest expenses come in simply maintaining the fleet size that you need. The average expense of one vehicle in your fleet is going to be around $6,000 per year (on the low end). Obviously, the more vehicles you have in your fleet, the more money you are going to be paying out. The challenge becomes having enough vehicles to meet the demand of your business without having too many vehicles on hand that are eating up your profits. And those are just the biggest expenses; there are a lot of little expenses that can whittle away at your profits, too, but that is a subject for another article. In regards to these expenses, though, some are just operating costs that you aren’t going to be able to avoid if you care about safety and productivity. Others, however, can be carefully monitored and kept to a minimum. Keep your fleet to the minimum number of vehicles that you need. The more cars you have, the more operating expenses you’ll face. Have regular maintenance done on your vehicles. While it’s tempting to avoid the cost of maintenance and just see how it goes, you’ll almost certainly face higher costs in the future when it comes to repairs. Lower labor expenses by retaining good employees with regular training and productivity goals. Increasing productivity means you’ll be able to get just as much done in less time, and retaining employees means you won’t be paying to find new ones and train them. Watch your data. Using telemetrics to get feedback on your vehicles and your drivers can help you identify problem areas and correct them before they end up driving up your costs. 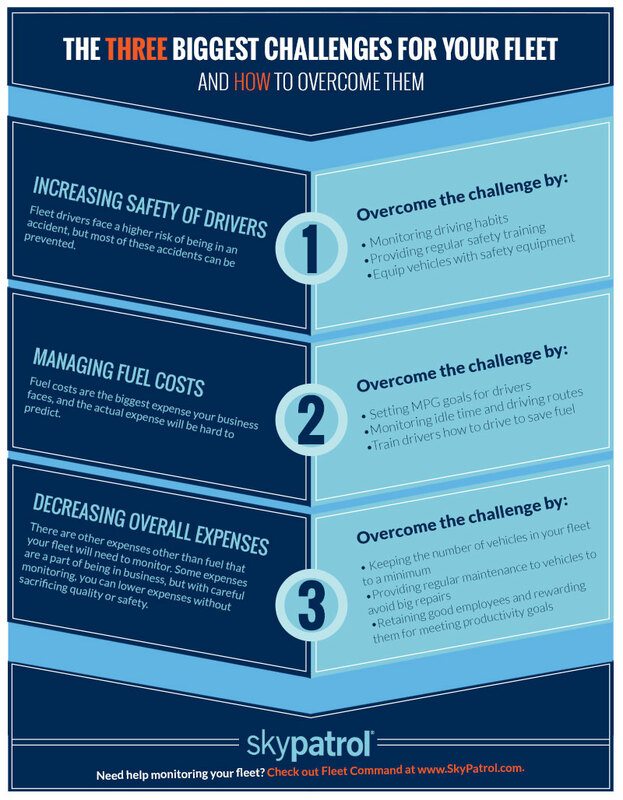 Does Your Fleet Need Help Overcome These Challenges? It doesn’t depend on how big or small your fleet is; decreasing your expenses while increasing your profits is the key to your success. But it’s a lot easier said than done. In order to overcome the challenges that your fleet is facing, you need to partner with a company who can provide you with reliable, informative data that can help you pinpoint problem areas and develop solutions. That’s where Fleet Command from Skypatrol can help. We’ve developed a GPS solution geared towards small to medium-sized fleets so you can track your vehicles and drivers and get the information you need to power better performance. Want to see what we can do? Schedule a demo with our team today by giving us a call or contacting us through the form on our website.